The UT Graduate Student Association has been recognized by the National Association of Graduate and Professional Students in the spring issue of its publication of The Postgraduate Voice. A news article called UT a leader in support for graduate education and complimented the institution for investing in its graduate students. 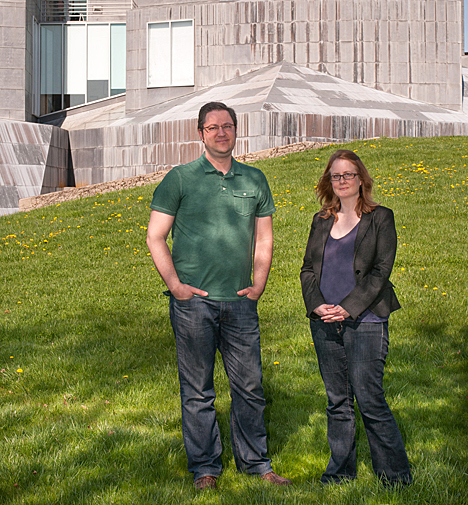 The publication also announced two awards for the University: the New Member of the Year Award and the 2013 Friend of Graduate Students Award. In the last four years, the UT Graduate Student Association has gone from being a relatively unknown organization with four executive board members to representing the University’s 4,700 graduate students. The association has increased its budget from less than $4,000 to $154,000, which puts it on par with graduate student associations at other Ohio universities and has allowed the group to create initiatives in support of students. The symposium is a multi-university and multidisciplinary event that is focused on giving graduate students the experience required to better their presentation skills and to meet fellow graduate students and potential collaborators from schools throughout the region. “We could not fulfill all the needs of each student before,” Waldman said. “Now we have invested more into programs like the symposium and travel reimbursement, which allows graduate students to attend conferences where they speak about and showcase the exceptional research being conducted at UT. We also have been able to award research funding through the newly formed Graduate Research Award Program, which averaged $2,000 for the 10 student projects. 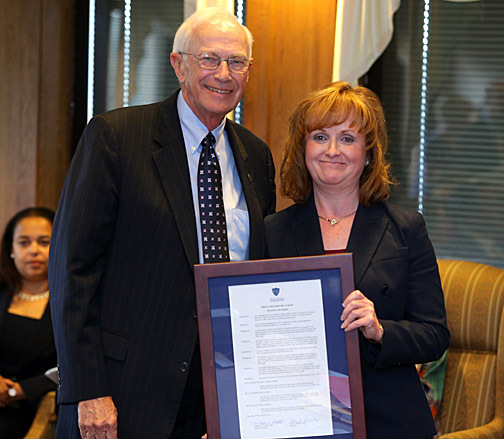 “I am honored to have served such an intelligent and vibrant group of individuals,” Waldman added. The National Association of Graduate and Professional Students presented the Friend of Graduate Students Award to Dr. Patricia Komuniecki, vice provost for graduate affairs and dean of the College of Graduate Studies. “Dr. Komuniecki’s commitment to graduate education continues to positively impact graduate students at The University of Toledo and throughout the nation,” according to the article in The Postgraduate Voice. Komuniecki is a strong advocate for UT graduate students and has been an adviser to the Graduate Student Association since her appointment as dean in January 2009. She has worked with the organization as it underwent its recent transformation. The UT Lake Erie Center is teaming up with Barefoot Wines and the Alliance for the Great Lakes to host a public Adopt-a-Beach cleanup Friday, June 28, at Maumee Bay State Park in Oregon, Ohio. The cleanup will take place from 4 to 6 p.m. at the Lake Erie beach at Maumee Bay State Park, followed by a free celebration party inside the Maumee Bay Lodge and Conference Center until 8:30 p.m. Surf-inspired fare and Barefoot Wine (for volunteers 21 and older) will be featured at the party. The Adopt-a-Beach program helps clean up Great Lakes beaches and shorelines with a special celebration recognizing volunteers’ efforts. In 2012, more than 12,000 Adopt-a-Beach volunteers removed 42,351 pounds of trash at 327 locations in Illinois, Indiana, Michigan, New York, Ohio and Wisconsin. Gray encourages members of the University community to volunteer to assist the UT Lake Erie Center with its mission to engage the community in environmental education, sustainable living, and informed outreach awareness programs through the fun Adopt-a-Beach program. For more information, visit greatlakes.org/adoptabeach or contact Gray at meredith.gray@utoledo.edu or 419.530.8361. The Main Campus Pharmacy at The University of Toledo is updating its hours of operation. The pharmacy located in the Main Campus Medical Center on the southwest side of campus will continue to serve customers Monday through Saturday, but will no longer be open on Sundays. “During a time of limited resources, we analyzed our traffic and because Sunday by far has the fewest customers, we decided eliminating Sunday hours would have the least impact on those who use the pharmacy,” said Karen Gallo-Willard, head pharmacist. The pharmacy will continue to be open Saturdays from 9 a.m. to 2 p.m. for those who prefer to get their prescriptions filled during the weekend. Thursday hours during the summer also will be extended an hour in the morning and half-hour in the evening from 7:30 a.m. to 5:30 p.m.
During the summer, the Main Campus Pharmacy operates from 7:30 a.m. to 5:30 p.m. Mondays and Thursdays, and from 8:30 a.m. to 5 p.m. Tuesday, Wednesday and Friday. Fall semester, the hours will return to the academic year schedule of Monday through Friday from 7:30 a.m. to 6 p.m. Saturday hours will remain from 9 a.m. to 2 p.m. throughout the year. In addition to its convenient location, the Main Campus Pharmacy offers prescription refills via an automated phone system at 419.530.3471 or online through its website. Email, call or text messaging services are available to inform patients when their prescriptions are ready to be picked up. A secured drop box outside the entrance also is available for prescription drop off when the pharmacy is closed. The extended summer hours on Thursdays will begin July 11 as the pharmacy will be closed Thursday, July 4, for the Independence Day holiday. “The Main Campus Outpatient Pharmacy will continue to provide students and faculty with a convenient location to get prescriptions filled and where they can receive counseling on all new, refill and transfer prescriptions from our highly trained pharmacists,” Gallo-Willard said. Two University of Toledo Medical Center employees have been nominated for a 2013 Healthcare Heroes Award and will be recognized at a reception Thursday, June 27, at 5:30 p.m. at the Toledo Museum of Art Glass Pavilion. Janelle Tipton, an oncology clinical nurse, and Dr. Joan Duggan, director of the Ryan White HIV Center, are two of the 23 nominated health-care professionals. Four will win a Healthcare Hero Award, and a Lifetime Achievement Award also will be presented at the annual awards reception organized by the Hospital Council of Northwest Ohio to recognize the contributions of health-care workers in northwest Ohio and southeast Michigan. Nominees must exemplify patient care, innovation, research, education, management or community service in order to be recognized. Tipton has worked at UTMC for 26 years, always with a focus on cancer patients. Tipton decided oncology interested her because of her nurse mentor, Lisa Hartkopf Smith, and her father’s cancer diagnosis while she was a new graduate nurse. She often gets referred to difficult or unique cases that involve complicated or newer forms of treatment. Some of Tipton’s community service includes working with the American Cancer Society’s Board of Directors and the Making Strides for Breast Cancer Walk. She also is a member of the Lucas County Colorectal Cancer Coalition and a past president of the Toledo Area Nursing Society. Duggan is in charge of the Ryan White Center at UTMC. She and her team care for about 800 HIV patients. Duggan said caring for those with HIV has been her passion and she considers it an honor. The patients are the real heroes, according to Duggan. UT has been the location of the federally funded Ryan White Center since 2000. Services include anonymous HIV testing, HIV prevention and education services, and pediatric HIV care and prenatal care. Duggan encourages all people between 13 and 64 years old to get tested. For more information on the Hospital Council of Northwest Ohio Healthcare Heroes program, visit hcno.org. 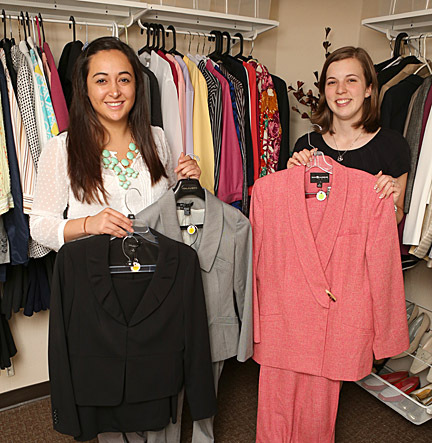 Claudia Cortez, a senior in the College of Business and Innovation who is an intern in the Catharine S. Eberly Center for Women, left, Emily Hardcastle and showed off some of the professional attire donated to Kate’s Closet. If you’re looking to aid in the empowerment of women, you don’t have to look very far. You can start by simply cleaning out your closet. The Catharine S. Eberly Center for Women recently introduced Kate’s Closet, a new program to further advance the empowerment of women in the work force, and is accepting donations. Kate’s Closet is a helpful resource for women who participate in Eberly Center programming that need professional attire at no cost. Starting in August, participants can make an appointment to shop in the closet with a trained volunteer style consultant. All donations are made by appointment only. If you are interested in donating gently used or new professional clothing or in volunteering to be a style consultant, contact Hardcastle at 419.530.7232 or emily.hardcastle@utoledo.edu. The U.S. Department of Energy Office of Energy Efficiency and Renewable Energy held its Clean Energy Manufacturing Initiative — Midwest Summit focusing on clean energy industries and technologies in The University of Toledo Memorial Field House June 21. Attending the Clean Energy Manufacturing Initiative — Midwest Summit last week were, from left, Dr. David Danielson, assistant secretary for energy efficiency and renewable energy for the U.S. Department of Energy, U.S. Sen. Sherrod Brown, U.S. Rep. Marcy Kaptur and UT President Lloyd Jacobs. The summit brought together more than 250 business, elected, regional economic development and university leaders to discuss concrete ways to expand and promote clean energy manufacturing throughout the region and across the nation. Dr. David Danielson, assistant secretary for energy efficiency and renewable energy for the U.S. Department of Energy, praised Toledo’s and UT’s Midwest culture and history in manufacturing and alternative energy, identifying them as key reasons the Glass City was selected as the site for the summit. “It is clear to me that The University of Toledo is breaking the ivory tower mold,” Danielson said, adding that UT President Lloyd Jacobs is leading UT toward being a center of commercial competitiveness in addition to fulfilling its educational mission. Saying he had a bias toward action, Danielson emphasized that about 20 members of his staff had joined him in the journey to Toledo as evidence of his interest in hearing ideas from the energy experts assembled. 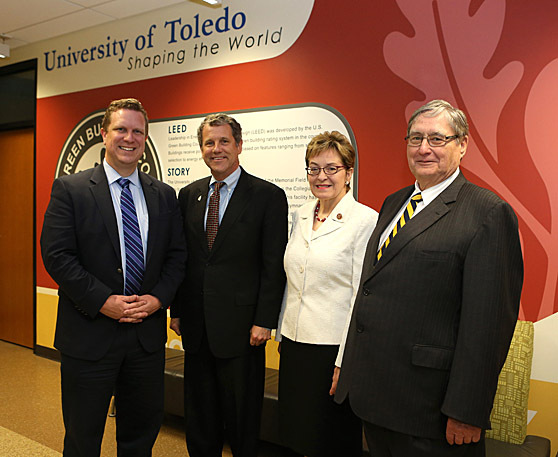 Joining Danielson in giving keynote speeches were U.S. Rep. Marcy Kaptur and U.S. Sen. Sherrod Brown; Deborah Wince-Smith, president and CEO of the Council on Competitiveness, also gave remarks. Jacobs said the summit served as further evidence of UT’s leadership position in alternative energy manufacturing. “It was an honor to host the Department of Energy, to hear from strong UT friends like Rep. Kaptur, Sen. Brown and the office of Sen. Portman, and to meet a new friend in Assistant Secretary Danielson,” Jacobs said. The Eleanor N. Dana Cancer Center will host a breast health and education day Friday, June 28, with free mammograms and clinical breast exams for eligible women. The event will take place from 1 to 5 p.m. in the center, located at 1325 Conference Drive on the UT Health Science Campus, and include educational information to raise awareness about breast cancer. Women who are eligible for the screening are those who are at least 40 years of age, have not had a mammogram in at least two years, have personal or family history of breast cancer, or are uninsured or under-insured. To determine eligibility and schedule an appointment, contact Jan Tipton, clinical oncology nurse, at 419.383.5170. 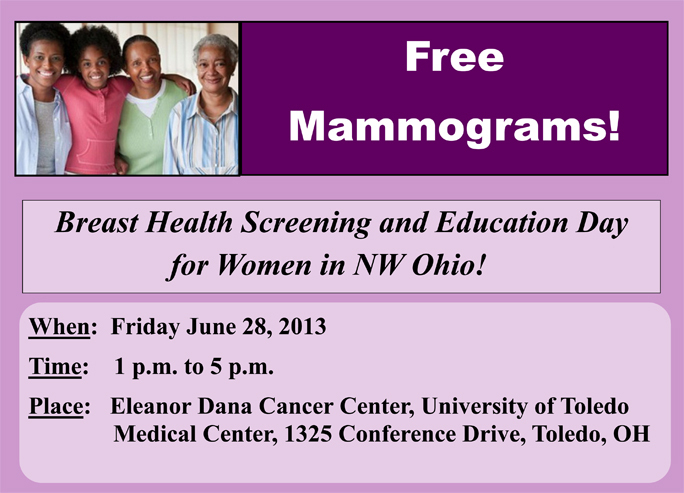 The screening day is supported with a grant from the Susan G. Komen Northwest Ohio Affiliate. The University of Toledo College of Business and Innovation recently presented its 16th annual Human Resource Management Award for Excellence, recognizing Spangler Candy Co. and Sun Federal Credit Union for outstanding HR practices. The Spangler Candy Co. Human Resources and its Teamster Union partners have created a productive working relationship that includes a recent win-win five-year contract. Furthermore, HR created multiple initiatives to support health, wellness and safety for employees, returning savings to the bottom line. Keeping employees happy and healthy enables the company to make 10 million Dum-Dum suckers — or “10 million smiles,” as the company prefers to think of them — every day. Sun Federal Credit Union considers itself a bank owned by the customer and strives to be like Bailey Building and Loan Association run by George Bailey (played by Jimmy Stewart) in the movie classic, “It’s a Wonderful Life.” Employees are concerned about the human experience, assisting people in all of life’s stages and challenges. Among the reasons the company was honored with the Human Resource Management Award for Excellence are because HR is a key business partner in Sun Federal’s success; HR impacts communications, business acumen, strategic agility and instills a shared vision; and HR plays a key role in continuous improvement. In addition to the winning companies, Directions Credit Union and Sylvania Franciscan Sisters were recognized as finalists. Directions Credit Union employees serve members and the community, and contribute to financial education of area residents. Employee development is encouraged through programs where workers can earn college degrees, and there is a mentor program between retired and new employees. In addition, an extended illness bank covers long-term absences. Sylvania Franciscan Sisters are value-based, and people who work there embrace its mission. The focus is on hiring good people who are challenged not just to know what their mission is, but to embrace it. They strive to be committed to each employee as a whole person. Among the reasons Sylvania Franciscan Sisters was a finalist for the award is because of its partnership between HR practitioners and the sisters that solidifies the mission and values into the organization. The HR Management Excellence Awards were established in 1998 by the UT Department of Management to encourage and recognize excellent progress and achievement in the field of human resource management. “These awards are given annually to celebrate the success of local organizations and leaders for creating great places to work and for making a real difference in our economy. They demonstrate to the region that area employers can compete in a world marketplace,” Longenecker said.